One thing we all have in common, is that we spend a lot of time on email. Reading, writing, responding, forwarding, deleting — unfortunately, while some of it is productive time, much of it is not. We’ll explore the subject of email over the next few posts on the Day-Timer Blog featuring Laura Stack, the Productivity Pro©. 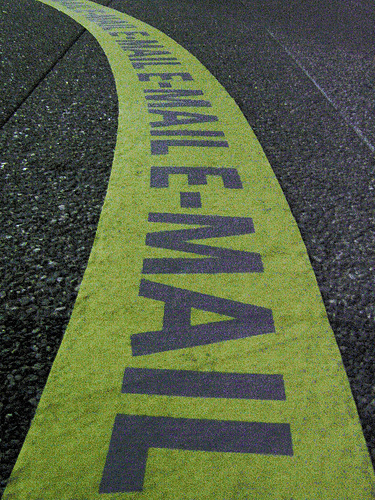 What are a few simple ways people can improve their email productivity? Laura: Just as technology can interfere with personal time, it can also wreak havoc with your productivity during normal working hours. Yes, you can set your email to tell you the instant a new message arrives. No, you shouldn’t drop everything to deal with every email as it comes in. Think about it. How many emails do you get in a single day? If you’re constantly checking your email, you’re constantly interrupting otherwise productive activities to deal with issues, which 99 times out of 100, aren’t important. Even if it only takes you a second to read a message, you’re still derailing your train of thought and wasting several minutes to get back on track. You don’t answer it anyway, leaving it in your inbox and adding to the stream-of-consciousness thinking in your head. Turn off your email alerts. Go under your Tools menu in Outlook, select Options, then Email Options, and Advanced Email Options. You’ll see “When a new email arrives in my box, do the following.” Uncheck all those boxes. Close Outlook completely. If you absolutely, positively can’t resist glancing at your email inbox, shut down Outlook completely. Turning off your alerts will prevent the envelope in the system tray from constantly reminding you there’s email waiting. Check at regular intervals, as few times as possible. I don’t believe it’s realistic to only check once a day, but you shouldn’t be checking it 27 times a day, either. Find a balance in responsiveness to your colleagues and self-control in getting your important work accomplished. Schedule work periods. Close your Outlook, put your IM on DND (do not disturb), forward your calls to voicemail, turn off your handheld, and shut down all technology, which will give you a period of time to concentrate. The big differentiating factor is control. Create a “bubble of silence” around yourself. ← How Do You Create Your Family Time?